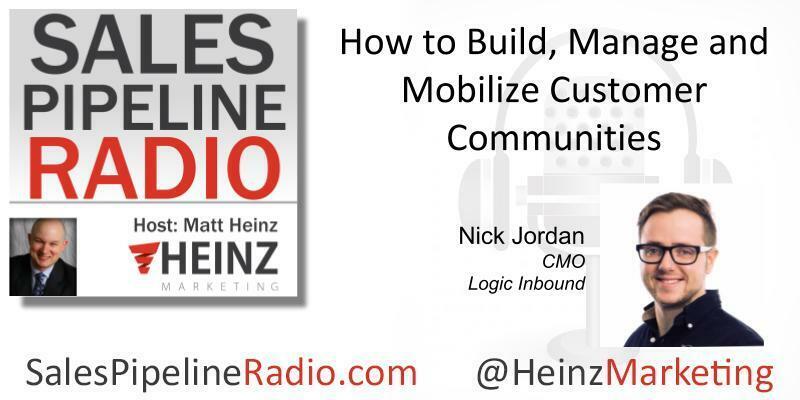 We pack a lot into this episode as I talk to Nick Jordan, CMO at Logic Inbound. Among other things, I ask him what are some of the challenges you've found in trying to build a marketing community? Sometimes we try to produce marketing events, and well-meaning people don't always come out in the way that some other groups, like IT and others, might do. So why do you think that is, and what are some keys to actions when trying to build that active marketing community? What are some of the ways you, or some of the formats of community you find the most successful? Is it lunch and learns, is it networking happy hours? Are there certain topics and formats that tend to work better in terms of getting marketers together? Nick is all about building community amongst marketers. Check out his answers as well as his number one growth hack for growing communities-- it's something everybody can go ahead and start implementing, as soon as they're done listening to this podcast! More from Nick: "I'm passionate about developing and growing businesses. A million side projects, a few startups, and one ride on a rocket ship as an early employee at BitTitan. Today I leverage my experience building businesses to help companies identify and execute on growth opportunities @ Logic Inbound." Check out the full transcript on the Heinz Marketing Blog starting Mon. 8/13/18 6am PST.